This whole no-pool thing has seriously got me down. I mean, if it were rainy, I could feel okay about indoor activities, but it’s so gorgeous that we all feel compelled to be outside, but without a stream or a sprinkler or a pool, it’s a little depressing. Today the ice cream truck came by, and the man said, “Great swimming weather!” as he handed out J’s Italian ice, and I had to restrain myself from kicking him in the teeth. I can kick pretty high–it’s one of my talents. But it’s not his fault that we can’t go swimming. M has been super-excellent about staying in socks and shoes, and we’re all hoping that when the doctor unwraps her tomorrow things will look Cured. Cross your fingers for us. There’s been some crafting around the house. 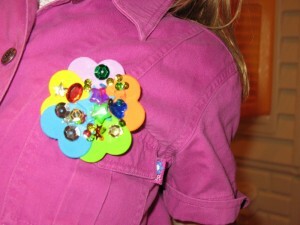 J came up with this clever brooch concept. 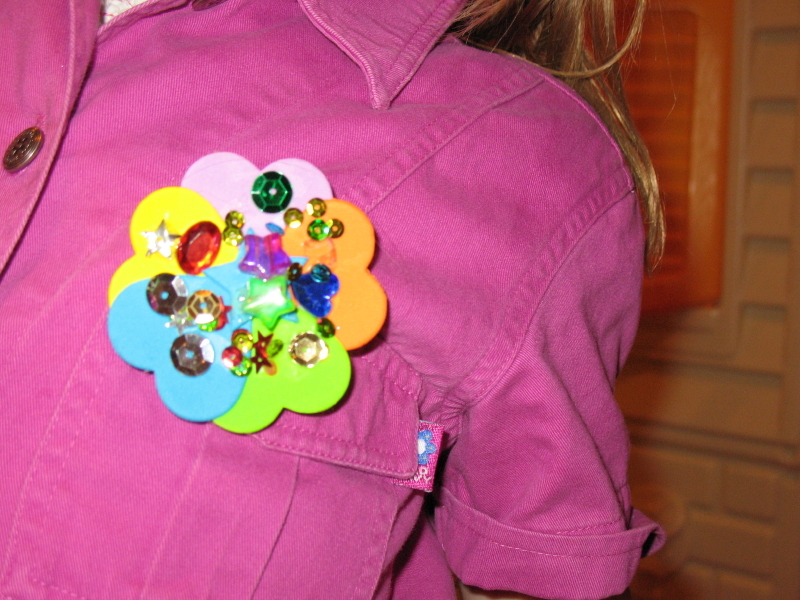 She stacked a bunch of sticky felt shapes on top of each other, then used white glue to add sequins, beads, and a safety pin at the back. I shored it up with a hot glue gun. OK, I went back and read all the vacation post. You have had a rough time! Poor M…I hope tomorrow’s appointment brings very good news! Love the pin. Any chance J. can make one for me? I’m sure she’ll be thrilled. I LOVE MY PIN, MISS J!